The African Bird Club bulletin includes the following largely unconfirmed records some of which were first published in Birding World and Dutch Birding. A Black-capped Petrel Pterodroma hasitata, photographed c.30 km off Agadir on 23 March 2013, has been identified, on the basis of a recently disclosed photograph, as the first record for Morocco (per Dutch Birding 39: 341); it may also be the first for mainland Africa. Another first for the country was an immature Steppe Eagle Aquila nipalensis, migrating north with Short-toed Snake Eagles Circaetus gallicus and European Honey Buzzards Pernis apivorus at Jbel Moussa on 18 May; in the Maghreb, the species was previously recorded in Tunisia but not yet in Algeria (per Go-South Bull. 14: 101–105). Records in May–December 2017 include the following. A Red-crested Pochard Netta rufina photographed at Laâyoune on 29 October would be the first for the Western Sahara, if accepted (per www.hbw.com/news/ first-country-reports). More than 1,500 White-headed Ducks Oxyura leucocephala were counted at Merja Fouarat, Kenitra, on 31 December— this is probably the largest wintering flock recorded in the country since the return of the species as a winter visitor and subsequently as a breeding species two decades ago. A female Goosander Mergus merganser photographed at Oued Loukkos, Larache, on 10 December is the sixth for Morocco; the last record dates from February 1988 (per www. magornitho.org). An immature Lesser Flamingo Phoeniconaias minor was at Oualidia on 16 October; although this is the 15th record for Morocco, most were in 1975–94, the last being on 3–4 May 2012. There are no records from Algeria and just one in Tunisia, of two birds at Thyna saltpans, Sfax, on 29 January 2010 (per Go-South Bull. 14: 230–234). A Rüppell’s Vulture Gyps rueppelli photographed at Mijk near Dakhla on 26 June was at least the second for the Western Sahara; the first concerned three individuals near Aousserd on 1 August 2011 (per Dutch Birding 39: 268). A White-backed Vulture G. africanus observed with four Rüppell’s Vultures Gyps rueppelli and Griffon Vultures G. fulvus on 5, 6 and 8 July at Jbel Moussa was the second for Morocco; the first was near Tétouan in May 2014 (per www. magornitho.org). On 10 November, four Cinereous Vultures Aegypius monachus, 2,700 Griffon Vultures Gyps fulvus and one Spanish Imperial Eagle Aquila adalberti were seen at Point Cires, Tangier, crossing the Strait of Gibraltar to Morocco (per Dutch Birding 39: 400–401). An adult male Peregrine Falcon Falco peregrinus, ringed as a nestling in northern Finland on 14 July 2013, was captured by poachers in the province of Médiouna on 1 November and released the same day after negotiations led by the Moroccan Association of Falconry and Raptor Conservation (AMFCR). A Saker Falcon F. cherrug, illegally captured on 27 November in the Casablanca region, was seized by the authorities on 3 December and handed over to the AMFCR, which took it into care until its release on 15 December. Five days later, the bird was found dead near the village of Megdoul Ouled Dahou having travelled 165 km; the autopsy suggested that it had starved to death (per Go-South Bull. 15: 1–6). In 2017, three pairs of Namaqua Doves Oena capensis bred near Mijk, Western Sahara; six juveniles were seen there on 11 August (per Dutch Birding 39: 337). Two or three Olive-backed Pipits Anthus hodgsoni at Jardin d’Essai, Rabat, from 5 November represented the sixth record for Morocco (per Dutch Birding 39: 414). Yellow-browed Warblers Phylloscopus inornatus were recorded at Melilla on 15 October, at Missour, Moyenne Moulouya, on 22 October, at Ben Ahmed, Settat, on 5 November and near Tagdilt Track, Boumalne n’ Dades, on 1 December; 14 previous records have been accepted by the Moroccan Rare Birds Committee (MRBC). A Pied Crow Corvus albus was still present at M’Hamid, south of Zagora, on 31 December; it was first seen there in November 2015. A Little Bunting Emberiza pusilla was mist-netted and ringed at Ceuta, the Spanish enclave on Morocco’s Mediterranean coast, on 7 November; there are only two confirmed records for Morocco: one ringed at Souss-Massa National Park in October 2013 and another photographed at Tiznit in February 2016. Additionally, Thévenot et al. (2003. Birds of Morocco) mention three possible records, two of which have since been rejected by the MRBC (per www.magornitho.org). Records from the period December 2016–June 2017 include the following. A Steppe Eagle Aquila nipalensis photographed at Jbel Moussa on 18 May is the first record for Morocco (per Go-South Bull. 14: 101–105), whilst a Lesser Scaup Aythya affinis at Barrage El-Mansour Eddahbi, Ouarzazate, on 18 March is the seventh. A Great Bittern Botaurus stellaris was observed at Larache on 30 December. A Great Black-backed Gull Larus marinus was photographed at Salé, Rabat, on 3 March—away from Khnifiss (see below), there are just a few records each year—and an Iceland Gull L. glaucoides at Ceuta on 4 February. The Pied Crow Corvus albus at M’hamid, Zagora, first noted in November 2015, remained until at least 21 March; another was photographed at Oumazza, near Rabat, on 1 May. The fifth Citrine Wagtail Motacilla citreola for Morocco was a male at Larache on 29–30 December (per www.magornitho.org and www. go-south.org). The following were reported from Western Sahara. At least 550 Marbled Teals Marmaronetta angustirostris were counted at ponds south of Guelmim on 9 March, with another 105 at a wetland on the northern outskirts of Laayoune on 10 March (GK, NB, DP & JS). Two male and one female Namaqua Doves Oena capensis were found near Mijk on 11–20 April; the species bred here for the first time in 2016. Up to four Golden Nightjars Caprimulgus eximius were heard calling at Oued Jenna from 5 February to at least April; up to four singing males were found in this area in March–April 2016. In Tarfaya, two adult and two presumed secondwinter Cape Gulls Larus dominicanus vetula were photographed at Khnifiss on 15 February, two adults at the dump south of Akhfennir on 25 February, and a pair and a single adult on the beach south of Akhfennir on 17–18 March; one of the latter was still present on 4 April. On 17 March, up to six adult Great Black-backed Gulls L. marinus were present at Khnifiss lagoon. The first confirmed Baltic Gull L. fuscus fuscus for Western Sahara was an adult at Dakhla on 24 February that had been colour-ringed on Gotland, Sweden (per Dutch Birding 39: 118–124, 200–206, www.magornitho.org and www.go-south.org). A Rüppell’s Vulture Gyps rueppelli photographed at Mijk near Dakhla on 26 June is the second record for the Atlantic Sahara—the first was of three birds at Aousserd on 1 August 2001. At Dakhla Bay, a Tawny Eagle Aquila rapax was seen on 8 January, whilst a male Red-footed Falcon Falco vespertinus was migrating north on 17 May (per www.go-south.org). A pair of Desert Eagle Owls Bubo ascalaphus with three fledged young were encountered near Oued Jenna on 12 March (GK, NB, DP & JS). 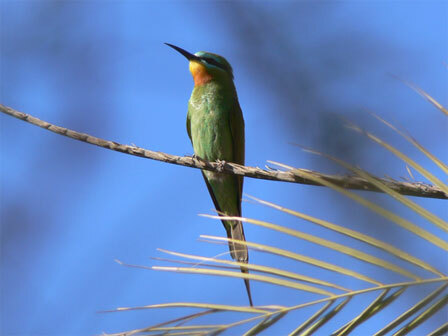 The second White-throated Beeeater Merops albicollis for Morocco remained at Dakhla Bay from 28 February until at least 1 May, where it was seen feeding on Vagrant Emperor Anax ephippiger dragonflies; the first was at Tachektent, Oued Ad-Dehab, on 5–6 December 2013 (per Dutch Birding 39: 127, 209 and www.magornitho.org; GK, NB, DP & JS). A Pied Crow first seen at Tarfaya on 9 January had moved to Khnifiss on 23 January; the species’ first record for Morocco was in December 2009 and the first breeding occurred in spring 2010 in Western Sahara, with several additional records since (per www.magornitho.org and Dutch Birding 39: 128). Sahara Scrub Warblers Scotocerca inquieta saharae near Dakhla on 10–11 January were the southernmost for the country (per Go-South Bull. 14: 5–10). A male Collared Flycatcher Ficedula albicollis in breeding plumage at Dakhla on 15–16 April is the second record for the Atlantic Sahara, following one of another male at Café Chtoukane on 9 April 2011. Up to 500 Desert Sparrows Passer simplex, including many juveniles, were present at Oued Jenna and near Aousserd village in April (per www.go-south.org). Up to 50 Sudan Golden Sparrows P. luteus remained at Oued Jenna and near Aousserd village from January into April, with another nine at Adrar Soutouf in early March; after the first at Oued Jenna in April 2009, the species has been quite regularly reported in Western Sahara since 2013 (per Dutch Birding 39: 60, 129, 211 and www.go-south. org; GK, NB, DP & JS). Singing House Buntings Emberiza sahari were found at Dakhla on 20 February and 4 March; the nearest site where the species is known to occur is 550 km to the north, at Tarfaya (per www.go-south.org). A Cinnamon Teal Anas cyanoptera photographed at Oualidia on 8 October 2016 may be the first for Morocco if accepted (per Dutch Birding 38: 452). The family of Namaqua Doves Oena capensis was still present at Mijk, near Dakhla, Western Sahara, on 4–12 August; breeding was confirmed in May (per Dutch Birding 38: 394). A Baird’s Sandpiper Calidris bairdii photographed at Khemis Zemamra on 28 October will be the first for Morocco, if accepted (BM per www.go-south.org); a previous claim, from Merzouga on 17 May 1996, was rejected. A Rüppell’s Vulture Gyps rueppelli in a flock of Griffon Vultures G. fulvus was photographed south of Jbel Moussa on 28 July (RE & FC per MaghrebOrnitho). A Lesser Spotted Eagle Clanga pomarina flying over Tanger-Med port on 1 October was the fifth for Morocco (and the second in 2016). A Pied Crow Corvus albus was photographed at M’hamid on 1 November; it was seen here for the first time in November 2015 (per Dutch Birding 38: 455–462). The following were reported for the period January–May 2016. In southwestern Morocco, flocks of 16 Lesser Flamingos Phoeniconaias minor at Oued Chebeika and six at Akhfennir were observed on 9 January. In Western Sahara, Namaqua Doves Oena capensis were reported from Gleib Jdiane on 15 March (two males) and 16 March (a male and a female) and near Aousserd on 18 March (three); the first breeding record was documented when a juvenile, with at least two males and two females, was photographed at Mejik, on 14 May. The first for the north was found near Rabat on 14 March. Golden Nightjars Caprimulgus eximius were reported from Aousserd and Oued Jenna, Western Sahara, on 16 March (at least four), Oued Jenna on 19–20 April (four), and Soutouf, Adrar (at Zawyate Antajjate on 23 March and at Oued Archane on 27 March); a male was found dead on the road near Oued Jenna on 20 April; the new records indicate that the species is breeding in Western Sahara (the first record was of a male between Dakhla and Aousserd on 3 May 2015). A first-year Allen’s Gallinule Porphyrio alleni at Gleib Jdiane, Western Sahara, from 18 February to 2 March was the 13th for Morocco, whilst the ninth Great Northern Diver Gavia immer for the country was photographed at Oued Massa on 25 February. Two unringed Northern Bald Ibises Geronticus eremita photographed at Larache, northern Morocco, on 1 March, were either from the Moroccan populations (at Tamri and SoussMassa National Park, c.640 km to the south-west) or from the reintroduced population in southern Spain (near Barbate, Andalusia, c.120 km to the north); ringed Bald Ibises from the Spanish population have already been observed in Morocco (e.g. in 2006 and 2007). A darkmorph Western Reef Egret Egretta gularis was observed at Dakhla Bay on 28 January. At Oued Souss, a first-winter Franklin’s Gull Leucophaeus pipixcan was seen on 12 February and 11 and 21 March, with a second-winter Common Gull Larus canus also there on 15–16 February. Adult Kelp Gulls L. dominicanus vetula were seen, e.g., at Anza, Agadir, on 25 January and at Dakhla Bay, Western Sahara, on 4 March. A rare influx of Razorbills Alca torda for south-western Morocco occurred with, e.g., an immature as far south as Dakhla Bay on 28 January, up to eight off Agadir on 18 February and up to ten foraging off the Tamri coast on 20 March (where earlier in the month several were picked up dead on the beach). At Jbel Moussa, northern Morocco, 3,730 European Honey Buzzards Pernis apivorus, 2,159 Black Kites Milvus migrans, four Rüppell’s Vultures Gyps rueppellii and one Spanish Imperial Eagle Aquila adalberti were counted on 5 May. Also at this site, due to bad weather at the Strait of Gibraltar, a large concentration of migratory vultures roosted on 7 May, including 58 Egyptian Neophron percnopterus, six Rüppell’s, >800 Griffon Gyps fulvus and three Cinereous Vultures Aegypius monachus. The fourth Lesser Spotted Eagle Clanga pomarina for Morocco was a second-calendar-year bird at Jbel Moussa on 21 May; previous records are from 1996, 2007 and 2010. A Spanish Imperial Eagle with a satellite transmitter was noted in the Guelmim area, southern Morocco, in mid January, whilst a secondcalendar-year was photographed south of Jbel Moussa on 27 April. The Pied Crow Corvus albus present since March 2015 south of Zagora, was seen again at Ouled Driss, M’Hamid, on 29 February. In Western Sahara, a juvenile Sudan Golden Sparrow Passer luteus was seen at Oued Jenna on 20 April (per www.magornitho.org and Dutch Birding 38: 102, 186–190, 240–253). The following were reported for the period May–December 2015. The second Long-tailed Duck Clangula hyemalis for Morocco was photographed at Essaouira on 20 December and was still present in January; the first for the country and continental Africa was photographed at Oualidia lagoon in June 2014. In 2015, 116 pairs of Northern Bald Ibises Geronticus eremita bred in Morocco, including 60 pairs with 111 young at the Tamri colony and 56 pairs with 94 young at the Oued Massa colony. In Western Sahara, single Namaqua Doves Oena capensis were photographed at Safia, Oued Dahab, on 19 and 22 May. Four Rüppell’s Vultures Gyps rueppelli flew past Fnideq, on the Mediterranean coast, on 4 June. On 28 October, two Rüppell’s Vultures and no fewer than 3,500 Griffon Vultures Gyps fulvus crossed the Strait of Gibraltar and passed Jbel Moussa. Five of the six juvenile Spanish Imperial Eagles Aquila adalberti fitted with satellite tags in Andalucía in 2015 stayed south of the Atlas in October; on 7 November, a first-year was photographed near Goulimime. A three-year-old male Peregrine Falcon Falco peregrinus ringed in Sweden was captured at Casablanca on 18 December and subsequently released. A Pied Crow Corvus albus was photographed at Fnideq on 26 March; probably the same individual was seen on 10 October, with one also found at Ouled Driss, M’Hamid, on 1 November; possibly two (or more?) Pied Crows are present in the area and are moving between northern Morocco, southern Spain and Portugal. Following a large influx into western Europe, a few Yellow-browed Warblers Phylloscopus inornatus were observed near Rabat from mid October. The following were reported for the period December 2014 - May 2015. Approximately 2,200 Scopoli’s Shearwaters Calonectris diomedea flew east into the Mediterranean past Tangier on 8 March and c.2,000 were seen around the Islas Chafarinas on 10 March. Ten European Storm-petrels Hydrobates pelagicus were noted on a pelagic out of Agadir on 23 March. A female Lesser Scaup Aythya affinis was observed at Oued Massa on 22 February and a Ring-necked Duck A. collaris at Essaouira on 5 December. A Great Northern Diver Gavia immer at Oualidia on 30 December was the seventh for Morocco. A first-year Allen’s Gallinule Porphyrio alleni was present at Oued Massa from 28 December. In the north, single Rüppell’s Vultures Gyps rueppelli were found at Djebel Moussa on 10 and 14 May. On 6 March c.1,000 Black Kites Milvus migrans were grounded by strong easterlies at Asilah with 700 south of Asilah the next day; 800 flew north in 30 minutes over Jebel Musa on 8 March. Notable northward migration over the sea of Western Marsh Harriers Circus aeruginosus was noted at Asilah, when c.70 passed in three hours on 6 March, with another 30 north over Asilah Plain earlier in the day. At least 105 Short-toed Snake Eagles Circaetus gallicus migrated north over Tangier / Jebel Musa on 8 March. An immature Spanish Imperial Eagle Aquila adalberti was photographed in the Zaer region on 4 March. In western Morocco (as well as in the Canary Islands), an unprecedented influx of Red-footed Falcons Falco vespertinus occurred in mid May. Fourteen Great Skuas Stercorarius skua flew east past Tangier on 8 March. An adult Bonaparte’s Gull Chroicocephalus philadelphia photographed at Dakhla on 19 March was the first for Western Sahara. If accepted, a first-summer Franklin’s Gull Leucophaeus pipixcan at Nador on 15 April will be the eighth for Morocco. A male Golden Nightjar Caprimulgus eximius was observed and later found dead along the road between Dakhla and Aousserd on 3 May; this is the first for Western Sahara and the Western Palearctic. In south-eastern Western Sahara, up to 31 Sudan Golden Sparrows Passer luteus were photographed at Bir Anzarane between 30 January and 6 February; this is the species’ northernmost record, as previous sightings were c.130 km to the south in the Aousserd area. The first American Purple Gallinule Porphyrio martinicus for the country was found at Kénitra on 15 November 2014; it was weak and taken into a garden, from where it flew off three days later. Two European Shags Phalacrocorax aristotelis of the coastal Moroccan race riggenbachi (‘Moroccan Shag’) were photographed among three pairs reportedly present at Tamri, north of Agadir, on 3 November. A first year Great Knot Calidris tenuirostris photographed in a flock of up to six Red Knots C. canutus at Oued Souss, Agadir, on 8 November was the second for North Africa; the first was an adult in summer plumage at the same site on 27 August 1980. A Yellow-browed Warbler Phylloscopus inornatus was at Yasmina, Merzouga, Tafilalt, on 22 October. The following records are from the period January - June 2014. Two species were recorded for the first time in Morocco, the first being a White-backed Vulture Gyps africanus observed with a flock of Rüppell’s Vultures G. rueppelli and Griffon Vultures G. fulvus near Tétouan on 25 May. Earlier in the month, three Rüppell’s Vultures had been seen at Jbel Bouhachem, c.40 south of Tétouan, on 10 May and four at Jbel Moussa along the Strait of Gibraltar on 11 May. The second was a Long-tailed Duck Clangula hyemalis, discovered at Oualidia in early June. A pelagic trip off Agadir on 8 June produced c.30 White-faced Storm-petrels Pelagodroma marina, a Wilson’s Storm-petrel Oceanites oceanicus, c.10 Balearic Shearwaters Puffinus (yelkouan) mauretanicus, two shearwaters identified as Yelkouan Shearwaters P. yelkouan, c.10 Manx Shearwaters P. puffinus, a male Grey Phalarope Phalaropus fulicarius in breeding plumage, an adult Sabine’s Gull Xema sabini in breeding plumage, and c.10 Great Skuas Stercorarius skua. In south-western Morocco, a Dark-bellied Brent Goose Branta bernicla was photographed at Khnifiss on 1 February; three were at the same site on 21 April. An Egyptian Goose Alopochen aegyptiaca was at Ifrane National Park on 1 June and a Greater White-fronted Goose Anser albifrons at Oued Ksob on 25 June. A Green-winged Teal Anas (crecca) carolinensis was observed at Khemiss Zemamra on 12 February. Rather late European Honey Buzzards Pernis apivorus were noted at Auberge Yasmina, Merzouga, on 1 June (one), near the Tagdilt Track on 3 June (one), and near Aousserd on 11 June (three). At Casablanca, a Purple Sandpiper Calidris maritima was seen on 18 January. A first-winter Iceland Gull Larus glaucoides, discovered at Oued Chebeika on 4 February, remained there until 26 February at least, whilst a Glaucous Gull L hyperboreus was at Essaouira on 1 January, with two there in early February and one still present on 27 February. A Ring-billed Gull L. delawarensis was photographed at Essaouira on 15 - 16 March. At Pointe de la Sarga, three Roseate Terns Sterna dougallii were observed on 12 June. A male Lichtenstein’s Sandgrouse Pterocles lichtensteinii was found at Tissint, Tata, on 8 March. In March, a higher than usual number of Isabelline Wheatears Oenanthe isabellina was noted. A Rosy Starling Pastor roseus was reported from Cap Beddouza in early March; this could be the third record for Morocco. Up to four Sudan Golden Sparrows Passer luteus were at Oued Jenna, Western Sahara, from 1 February into March - the first record for Western Sahara was in the same area in April 2009; one was seen again at Awserd on 23 April. A flock of >100 Desert Sparrows P. simplex was at Oued Jenna, with ten 5 km north of Aousserd and 12 c.10 km south of Aousserd, on 11 June; none was found near Merzouga. A Snow Bunting Plectrophenax nivalis photographed at Imlili on 10 February may be the fifth record for Morocco and the first for the Atlantic Sahara. The following records are from the period April - December 2013.The most unusual report was of a White-throated Bee-eater Merops albicollis observed at Gleb Jdiane, Oued Ad-Deheb, Western Sahara, on 5 - 6 December; this is not only a first for Morocco but also for the Western Palearctic. Seawatching at Cap Rhir, north of Agadir, on 8 July yielded, among others, three White-faced Storm-petrels Pelagodroma marina, 25,000 Cory’s Shearwaters Calonectris borealis, five Sooty Shearwaters Puffinus griseus, a Barolo (Macaronesian) Shearwater P. b. baroli and a Bulwer’s Petrel Bulweria bulwerii. Two Great Shearwaters Puffinus gravis were observed off Bouznika, Zaër, on 24 August. A Blue-winged Teal Anas discors was at Dar Bouazza, Casablanca area, in October - November. In eastern Morocco, a Red-footed Falcon Falco vespertinus was photographed near Midelt on 10 October. A few Common Buttonquails Turnix sylvaticus were singing between Oualidia and El Jadida, western Morocco, on 18 - 19 May; a new highway planned between these two towns may threaten the survival of the last known population of the nominate subspecies. At Casablanca, a Purple Sandpiper Calidris maritima was at the Marabout de Sidi Abderrahmane on 17 December. A Long-billed Dowitcher Limnodromus scolopaceus was seen in the Larache marshes on 25 August. In Western Sahara, an Upland Sandpiper Bartramia longicauda was photographed near Dakhla, Oued Ad Deheb, on 11 October. Single Ring-billed Gulls Larus delawarensis were reported from Oued Ksob on 28 April, Essaouira on 23 August and Dar Bouazza on 16 November. At Oukaïmeden, western High Atlas, a White-rumped Swift Apus caffer was noted on 15 July. Five Yellow-browed Warblers Phylloscopus inornatus were encountered in the Figuig area on 3 - 6 November and a male Red-breasted Flycatcher Ficedula parva was observed at Essaouira on 23 October. The following records are from December 2012 - April 2013. Breeding Northern Bald Ibis Geronticus eremita in 2012 had mixed success at the species' last two colonies. At Oued Massa, south of Agadir, 34 pairs bred (two fewer than in 2011) and 95 chicks hatched, of which 56 fledged (in 2011, 79 fledged), whereas at Tamri, north of Agadir, the breeding was a complete failure with 43 pairs present (in 2011, there were 51) of which only 11 laid eggs and none completed incubation. An adult was observed at Boujdour, Western Sahara, 680 km south of the Agadir colony, on 27 December. At Sidi Bou Rhaba, the number of White-headed Ducks Oxyura leucocephala rose to 90 individuals in February; the species first bred at this site some five years ago. An immature Golden Eagle Aquila chrysaetos flew south over Boulariah barrage, c. 100 km from the Mauritanian border, south-west of Aousserd, Western Sahara. In February c.50 Houbara Bustards Chlamydotis undulata were reportedly killed in four days by a Saudi falconry group in the Erfoud area. The fourth Bonaparte's Gull Chroicocephalus Philadelphia for Morocco was an adult seen north of Sidi Brahim, Oualidia, on 26 January; a second calendar-year individual was photographed 43 km north of Oualidia on 27 April. An adult Kelp Gull Larus dominicanus vetula and nine Great Black-backed Gulls L. marinus were at Khnifiss lagoon, in the south-west, on 24 December. In Western Sahara, 100s of Black-crowned Sparrow Larks Eremopterix nigriceps and Dunn's Larks Eremalauda dunni were still singing along the Aousserd road in early February after the rains in November 2012; on c.11 January four nests of Dunn's Lark were found. Pale Crag Martins Ptyonoprogne obsoleta were photographed at Begaa near Merzouga, Tafilalt, on 15 March. An Isabelline Wheatear Oenanthe isabellina was observed at Erfoud on 25 February. Three family groups of Cricket Warbler Spiloptila clamans were encountered west of Awserd, Western Sahara, in late December - early January, whilst on 28 March a Streaked Scrub Warbler Scotocerca inquieta was found 10 km south of Boujdour (which is further south than mentioned in a recent paper on this species in Morocco. A Pallas's Leaf Warbler Phylloscopus proregulus trapped at Yasmina hotel, Merzouga, Tafilalt, on 20 April was the second for the country; at the same site, the second Moltoni's Subalpine Warbler Sylvia cantillans moltonii was trapped on 18 March. A first-winter Red-breasted Flycatcher Ficedula parva was seen 115 km north-west of Awserd on 30 December. On 29 January, an unseasonal Balearic Woodchat Shrike Lanius senator badius was singing at Oued Massa. Two Sudan Golden Sparrows Passer luteus were observed at Awserd, Western Sahara, on 12 January. The following reports are from 2012. An immature Black Vulture Aegypius monachus was seen on passage with a group of 23 Eurasian Griffon Vultures Gyps fulvus at Meknès on 14 November. A second-calendar year Bateleur Terathopius ecaudatus flew over the Strait of Gibraltar from Morocco to Spain in the late afternoon of 5 April. On 9 February, a juvenile Spanish Imperial Eagle Aquila adalberti was noted 78 km south of Goulimine. An Allen’s Gallinule Porphyrio alleni was claimed from a pond along the Ifrane - Fes road on 20 March. During two hours of sea-watching (at 07.00–09.00 hrs) from Tarfaya harbour on 1 November, 26 Sabine’s Gulls Xema sabini were counted, whilst an adult Ring-billed Gull Larus delawarensis was seen at Barrage Arabet, Bou-Areg, on 3 November. Vagrant waders included a Pectoral Sandpiper Calidris melanotos at Casablanca on 29 September and a Spotted Sandpiper Actitis macularius at Khnifiss on 2 November. The sixth Yellow-browed Warbler Phylloscopus inornatus for Morocco was observed at Agadir on 29 October. The following records are from January - May 2012. Six European Storm-petrels Hydrobates pelagicus were seen at Agadir marina on 6 February, with six more offshore. Great Egrets Egretta alba were reported from Aoulouz on 8 February (one); Rissanion on 12 February (three); Barrage el Mansoor Eddhabi, Ouarzazate, on 13 - 14 February; and Souss-Massa National Park on 16 March; from May 2012 this species is no longer considered by the Moroccan Rare Birds Committee. The Western Reef Heron Egretta gularis at Essaouira, first found on 18 April 2009, was seen again in February. A Grey Heron Ardea cinerea of the Mauritanian race monicae was claimed from Lagune de Khnifiss, Western Sahara, on 22 April. A census in 2011 counted 511 Northern Bald Ibises Geronticus eremita, all in the Agadir area. In the south-east, a Lesser Flamingo Phoeniconaias minor was seen with 540 Greater Flamingos Phoenicopterus (ruber) roseus at Dayet Srji, Merzouga, on 3 - 4 May. More than 60 White-headed Ducks Oxyura leucocephala were counted at Sidi Bou Rhaba, Kenitra, where the first successful breeding occurred in 2009. A juvenile Saker Falcon Falco cherrug was seen in the Souss Valley near Aoulouz on 10 March. A pair of Baillon’s Crakes Porzana pusilla was at Tissint on 14 March. The second White-rumped Sandpiper Calidris fuscicollis for Morocco was photographed on 29 April at Merzouga, where it remained until at least 3 May. Other noteworthy waders included a Broad-billed Sandpiper Limicola falcinellus at Sidi Moussa, Oualidia, on 21 April, a Terek Sandpiper Xenus cinereus at Larache on 19 May, and an adult Spotted Sandpiper Actitis macularius at Fort Bou-Jerif on 26 - 27 April. On 20 January, a Bonaparte’s Gull Larus philadephia was photographed at Oualidia. The southernmost Glaucous Gull L. hyperboreus for the African mainland, and the 15th for Morocco, was a first-winter at Khnifiss lagoon on 14 - 15 January; it was also reported there on 27 February. At the same site, ten Great Black-backed Gulls L. marinus were counted on 26 - 27 March. Only three Dunn’s Larks Eremalauda dunni were reported from the southern Western Sahara in January - February, including two west of Oued Jenna, with a flock of 30 Black-crowned Sparrow Larks Eremopterix nigriceps a few kilometres away, on 10 January; singles were also seen near Foum Zguid, Zagora, on 29 April, and at Merzouga, in April and on 2 May. At least one, but possibly up to eight (Western) Pale Crag Martins Ptyonoprogne obsoleta presaharica were photographed at Oued Jenna and Aousserd on 10 - 12 January; two were reported at Café Chtouca, Western Sahara, on 23 April - this taxon is rare in Morocco and often hard to separate from Eurasian Crag Martin P. rupestris. Isabelline Wheatears Oenanthe isabellina were photographed west of Tinerhir in Dadès-Draa and Tafilalt on 13 - 14 March (three) and near Âït-Labbès, Eastern High Atlas, on 13 March (one); in late March several more were reported. The second and third Olive-backed Pipits Anthus hodgsoni for Morocco and Africa were observed and sound recorded at Imouzzer, Haha, in the mountains north of Agadir, on 23 January; the first was photographed at Agadir on 8 - 9 November 2007. The first Eastern Bonelli’s Warbler Phylloscopus orientalis for the country was claimed from Oued Massa on 11 March. The Pied Crows Corvus albus which bred in the Western Sahara in 2010 could not be found in January; apparently, the birds were last reported on 24 April 2011. Records from the period April - December 2011 are as follows. A Bulwer’s Petrel Bulweria bulwerii and a White-faced Storm-petrel Pelagodroma marina were observed off Cap Rhir on 16 June. The long-staying Western Reef Egret Egretta gularis at Essaouira, first reported on 18 April 2010, was still present in October, whilst another dark morph was found 21.6 km south of Sidi Abed, Oualidia, on 21 June. A male Lesser Scaup Aythya affinis remained near Mijk, Dakhla, from April until mid May; one (the same individual?) was photographed in the same area on 15 December. Three Rüppell’s Vultures Gyps rueppellii were photographed on the ground 5 km west of Aousserd, Oued Ed-Dahab, Western Sahara, on 1 August. A Long-billed Dowitcher Limnodromus scolopaceus was discovered in the Lower Loukkos Marshes, Larache, on 18 September. At Aghroud beach, north of Agadir, an adult Franklin’s Gull Larus pipixcan and an adult Great Black-backed Gull L. marinus were seen on 16 June. Two juvenile Great Spotted Cuckoos Clamator glandarius were being fed by Magpies Pica pica mauretanica 79 km south of Safi on 19 June; there are perhaps fewer than ten proven breeding records from Morocco. The first Collared Flycatcher Ficedula albicollis for the Moroccan coast was a male photographed 152 km north-east of Dakhla, Western Sahara, on 11 April. Records from the period November 2010 - May 2011 are as follows. Four White-faced Storm-petrels Pelagodroma marina were seen 22 nautical miles off Agadir on 30 April. Single Great Bitterns Botaurus stellaris were observed at Mechra Homadi dam on 12 November and Merja Zerga on 26 February. The Western Reef Heron Egretta gularis at Essaouira from 18 April 2010 was still present on 30 April. A Great Egret Egretta alba remained at the Souss estuary through December. Two Lesser Flamingos Phoeniconaias minor were reported from Larache on 3 January. Three Brent Geese; Branta bernicla were at La Sarga, Dakhla, on 11 January. A male Green-winged Teal Anas carolinensis was at Massa River mouth on 28 March. A male Ring-necked Duck Aythya collaris was seen between Sidi Bettache and Sidi Yaya Zäer on 26 February, whilst another was photographed at Kénitra on 16 May. A Rüppell’s Vulture Gyps rueppellii photographed at Jbel Moussa, Tangier peninsula, on 7 May may be the first documented record for northern Morocco. A young Spanish Imperial Eagle Aquila adalberti was reported flying north at Cascade d’Ouzoud on 20 February. A Red-footed Falcon Falco vespertinus was near Mgouna, between Boumalne and Ouarzazate, on 11 May. Crake records include a Baillon’s Crake Porzana pusilla at Gleb Jdiane on 2 March, a Little Crake P. parva photographed at Oued Loukkos, Larache, on 16 April, and two Corn Crakes Crex crex flushed at Oued Massa in the second half of January. An immature Allen’s Gallinule Porphyrio alleni was reportedly found dead at Tahaddart, Tanger, on 16 January. An American Golden Plover Pluvialis dominica was observed at Essaouira in mid March and photographed there on 11 April. Remarkably, a Buff-breasted Sandpiper Tryngites subruficollis at Ouarzazate on 9 - 10 April was photographed at the same inland desert site as one on 24 April 2006. A Lesser Yellowlegs Tringa flavipes was reported from Sidi Moussa, Oualidia, between 19 February and 14 March, with a Bonaparte’s Gull Larus philadelphia also there on 21 March. An adult Franklin’s Gull L. pipixcan was seen at Oued Souss, Agadir, on 12 December, whilst no fewer than 11adult and five immature Ring-billed Gulls L. delawarensis were claimed from Dakhla on 11 January. In spring 2011, four Cape Gulls L. dominicanus vetula including a breeding pair were present at Khnifiss lagoon in south-west Morocco, which confirms the species’ presence in the area. Many previous claims from Khnifiss lagoon have been shown to be misidentified Great Black-backed Gulls L. marinus and most if not all nesting large black-backed gulls reported at this site since February 2008 in fact concern the latter species. Cape Gull is thus still a rarity with only a few adults to be accepted for Khnifiss lagoon (those documented by photographs were two on 23 April 2009, one on 20 May 2009 and two on 7 July 2010), and just a few photographed though not yet accepted elsewhere in Morocco (a first-winter on 16 April 2009 at Dakhla, Western Sahara, and an adult at Oued Souss, Agadir, on 10 April 2010. Seven Great Black-backed Gulls were also present, with some nesting; the breeding records at Khnifiss lagoon are the first for Africa, c.2,000 km south of the nearest known breeding site in France. A male Namaqua Dove Oena capensis was at Oued Sayed on 9 April. Two Dunn’s Larks Eremalauda dunni were claimed from Tagdilt track on 3 March, whilst one was photographed at Derkaoua, Merzouga, on 9 April. An Aquatic Warbler Acrocephalus paludicola was seen near the bridge over the Massa River in the second half of January. Numbers of Eastern Olivaceous Warblers Hippolais pallida reiseri appear to be higher than previously thought; for example, eight were found in tamarisks by Mansour Lake near Ouarzazate between 31 March and 18 April. A Red-backed Shrike Lanius collurio was between Tamagourte and Outerbat, Central High Atlas, on 10 May. Up to three Pied Crows Corvus albus 152 km north of Dakhla, Western Sahara, were seen again in late December and were still present in March. Records from the period April - October 2010 are as follows. Seawatching from Cap Rhir, north of Agadir, on 14 July, produced eight Macaronesian (Little) Shearwaters Puffinus (assimilis) baroli, a White-faced Storm-petrel Pelagodroma marina and two Madeiran Storm-petrels Oceanodroma castro, with c.200 Balearic Shearwaters Puffinus mauretanicus observed there on 25 October. The long-staying Western Reef Heron Egretta gularis near Essaouira, first found on 19 April 2009, was still present in July 2010. On 3 October, up to 15 Plain Martins Riparia paludicola were seen at Oued Loukkos, Larache. A Richard's Pipit Anthus richardi was seen at Oued Souss on 27 October. In April, a presumed male hybrid Western Mourning Oenanthe (lugens) halophila × White-crowned Wheatear O. leucopyga paired with a female Western Mourning Wheatear was photographed along the Tagdilt track, near Boumalne. Records from November 2009–May 2010 are as follows. At Tetouan, the first Leach's Storm-petrel Oceanodroma leucorhoa for the country's Mediterranean coast was found exhausted on 9 January. A male Lesser Scaup Aythya affinis was discovered at Oued Massa on 11 February. At least one White-headed Duck Oxyura leucocephala remained at Sidi Bou Rhaba, Kénitra, during April. At Merzouga, Tafilalt, 1–2 Eurasian Bitterns Botaurus stellaris were singing at Dayet Srij on 9 April; this is the south-easternmost record for Morocco, where the species is less than annual in coastal marshes in the north. The long-staying Western Reef Egret Egretta gularis at Essaouira, first found on 19 April 2009, was still present on 27 February. An adult Lesser Flamingo Phoeniconaias minor was foraging among a flock of c.100 Greater Flamingos Phoenicopterus (ruber) roseus north of Oualidia, 68 km south of El Jadida, on 1–5 May. A Tawny Eagle Aquila rapax was seen at Merzouga on 6 February. Several Baillon's Crakes Porzana pusilla were found in flooded fields at Oued Massa in the second week of April; there are only two previous records for Morocco in the past 15 years. At Khnifiss lagoon, Tarfaya, in the south-west, up to nine Cape Gulls Larus dominicanus vetula stayed from 18 November to at least April; at least eight with one active nest were counted on 14–29 April. At Oued Souss, Agadir, c.450 km further north, an adult was photographed on 12 April and two Laughing Gulls L. atricilla were there on 19 April. A Grey-hooded Gull Larus cirrocephalus was noted at Dakhla, Western Sahara, on a few dates between January and April. In the south-east, the first Dunn's Larks Eremalauda dunni for the Tafilalt were observed from 11 April near Merzouga; on 3 May, eight birds and a nest were found at three sites (the first records for the country were from Oued Ad-Deheb, Western Sahara, in 2006). A Dupont's Lark Chersophilus duponti was singing at Tizi-n-Taghatine, west of Tazenakht, on 7 and 11 April. Eastern Olivaceous WarblersHippolais pallida of the North African race reiseri were found again in increasing numbers in suitable habitat in the south. A total of 25 Cricket Warblers Spiloptila clamans was counted west of Aousserd, Western Sahara, on 12 December; 55 were found on 24 January, and a male was seen feeding nestlings on 13 February. A Woodchat Shrike Lanius senator of the race badius, the fourth for Morocco, was photographed 41 km west of El Kelaa on 27 March. Three Pied Crows Corvus albus c.160 km north-east of Dakhla, first seen on 13 December, were breeding on a pylon on 25 April; these constitute the first for Morocco. It appears that 2–3 birds have been present here for three years, but there are no previous proven breeding records. Records from the period April–November 2009 are as follows. A Western Reef Egret Egretta gularis found at Essaouira on 18 April was still present on 13 November. In 2009, White-headed Ducks Oxyura leucocephala succesfully raised young at Sidi Bou-Rhaba, Kénitra, where at least seven were counted on 4 October; this accidental visitor was a resident until at least the early part of the 20th century, but occasional breeding was considered likely following the recent increase in numbers in Spain. A satellite-tracked Saker Falcon Falco cherrug, a juvenile from Hungary, flew via Spain and Portugal to Morocco; Thévenot et al. (2003. The Birds of Morocco) mention just two certain previous records, one collected in the late 19th century and another captured in May 1963. Two adult Grey-hooded Gulls Larus cirrocephalus were photographed at Oued Souss, Agadir, on 19–21 May. In July,Cricket Warblers Spiloptila clamans continued to be seen between Dakhla and Awserd. A Red-breasted Flycatcher Ficedula parva was reported from Goulimime on 11 November. Records from February - May 2009 (with one from November 2008) include the following. A Great Northern Diver Gavia immer was at Khnifiss, Tarfaya, on 8 March. A flock of 42 Great Cormorants Phalacrocorax carbo sinensis flew north over the desert east of Boumalne Dadès on 29 March. A Grey Heron Ardea cinerea of the pale Mauritanian race monicae was photographed at Hoja Llamera, Dhakla Bay, on 22 April and another at Khnifiss lagoon, Tarfaya, on 23 April; these are the first for Morocco. In April - May, up to two adult Bearded Vultures Gypaetus barbatus were frequently observed at Oukaimeden, High Atlas, where the species is considered close to extinction. A second-year Spanish Imperial Eagle Aquila adalberti stayed at the Tagdilt track, near Boumalne Dadès, in late March. A juvenile Allen’s Gallinule Porphyrio alleni was captured and taken into care at Melilla, the Spanish enclave in northern Morocco, on 21 November 2008; it died six days later. Between 30 March and 10 April, two male Houbara Bustards Chlamydotis undulata were seen south of Erfoud; this Vulnerable species has been reported slightly more frequently in recent years. In the south-west, at least ten adult Kelp Gulls Larus dominicanus stayed at Khnifiss lagoon from at least early March until early May. On 10 April, one was exchanging positions on a nest with a Yellow-legged Gull L. cachinnans michahellis, and a pair was seen distantly on a nest. In West Saharan Morocco, a few Great Black-backed Gulls Larus marinus were recorded, e.g. at Dakhla on 20 April. A Black-legged Kittiwake Rissa tridactyla was reported from the desert at Agdz, Dadès-Draa, on 17 February. At least 1,000 Gull-billed Terns Sterna nilotica were roosting at Oued Souss on 14 April; this is an exceptionally large number. In early April, Tawny Owls Strix aluco were found nesting in the town centres of Marrakech and Taroudannt. Probably hundreds of Dunn’s Larks Eremalauda dunni and even larger numbers of Black-crowned Sparrow Larks Eremopterix nigriceps were present along the Dakhla - Aousserd road, in West Saharan Morocco, in late April - early May. An Isabelline Wheatear Oenanthe isabellina was observed at Tafraoute, Western Anti-Atlas, on 15 or 16 February. Since spring 2006, Eastern Olivaceous Warblers Hippolais pallida of the pale, North African race reiseri have been found frequently in the south-east; until recently, its occurrence in Morocco was poorly documented and required confirmation. In March - April, the taxon was found again at various places in Morocco, with birds singing at Aoufouss (two), Merzouga, Ouarzazate (two) and Touroug (four); it has presumably been overlooked in the past. In West Saharan Morocco, four Cricket Warblers Spiloptila clamans were seen along the Dakhla - Aousserd road on 22 March and in late April; on 8 May, up to nine were found. Also there, two male and five female Sudan Golden Sparrows Passer luteus were observed (and photographed) on 21 April, along with several tens of Desert Sparrows P. simplex. The latter species has become rare in the south-east in recent years, being replaced by House Sparrows P. domesticus at former strongholds like Café Yasmina near Merzouga; on 30 March three fledglings were being fed by a male while the female was sitting on the only nest known in this area this spring. In October 2008, 13 Ferruginous Ducks Aythya nyroca were observed at Oued Massa on 31st and 2,340 Audouin’s Gulls Larus audounii on the beaches between Agadir and Tamri on 30th. In the south-west, nine Richard’s Pipits Anthus richardi were seen at Sidi Wassai, Oued Massa, on 31st. A male hybrid Black Redstart Phoenicurus ochrurus × Common Redstart P. phoenicurus was photographed at Aguelmouss, near Tizi-n-Tichka in the High Atlas, on 27th. At the Tagdilt Track c.50 Trumpeter Finches Bucanetes githagineus were present on 28th. In January 2009, a Short-eared Owl Asio flammeus was found at Oued Souss on 12 January 2009 and a Plain Swift Apus unicolor at Oued Massa the next day. Records from November 2007 - April 2008 include the following. A Black Kite Milvus migrans with a yellow bill was photographed at Tizi-n-Tichka in the High Atlas on 8 April; there is one only previous claim of a ‘bird with a yellow bill’, near Tinerhir on 5 April 1978. Possibly the southernmost Purple Sandpiper Calidris maritima in the country was photographed near Essaouira on 2 March; there is at least one previous record of two individuals wintering at this site in 1999. The fourth Iceland Gull Larus glaucoides for Morocco was photographed at Essaouira on 2 March. Four adult Kelp Gulls L. dominicanus vetula were reported from Khnifiss lagoon, south-western Morocco, on 19 February, with one still there on 24th. A Eurasian Wryneck Jynx torquilla singing near Ifrane on 16 May was a late date. Two Pale Crag (Rock) Martins Ptyonoprogne fuligula obsoleta were seen at El Argoub, Western Sahara, on 27 February. On 8 - 9 November, an Olive-backed Pipit Anthus hodsoni was photographed at Agadir. A pair of Cricket Warblers Spiloptila clamans was collecting nesting material west of Awserd, Western Sahara, on 17 - 18 February. A Wood Warbler Phylloscopus sibilatrix was observed at Ifrane on the late date of 19 May. In south-eastern Morocco, several singing Western Olivaceous Warblers Hippolais pallida reiseri were found near Rissani and Merzouga, Tafilalt, on 27 March and 12 April. A calling second- year male Moltoni’s Subalpine Warbler Sylvia cantillans moltonii photographed in a wadi near Taouz, Tafilalt, is probably the first to be documented for Morocco. Along 10 km of the Tizguite Valley, Ifrane, c.50–60 pairs of Atlas Flycatchers Ficedula (hypoleuca) speculigera were counted. An adult male Red-backed Shrike Lanius collurio was in the Ourika Valley, Marrakech, on 31 December. The numbers of Desert Sparrows Passer simplex in Tafilalt, south-eastern Morocco, appear to be decreasing with only two pairs found east of Merzouga in March - April; however, the species was still numerous along the Aoussert road in Western Sahara in February. A Little (Kurrichane) Buttonquail Turnix sylvaticus was photographed at Oualidia on 16 September 2007. Records from October 2006 - April 2007 include the following. A Red-breasted Merganser Mergus serrator, a rare winter visitor, was at Oued Souss on 16 January. A Great Bittern Botaurus stellaris was found in the Lower Loukkos marshes, Rharb, on 20 March; the species is a former breeder (at this site), but is now a scarce passage migrant and rare winter visitor. The first Green-backed Heron Butorides striata for Morocco was discovered 70 km south of Tazenakht, in the Anti-Atlas, on 18 April. At Merzouga, a dark-morph Eleonora’s Falcon Falco eleonorae was observed on 30 March; this is an early date. An Aquila 11 km west of Tantan, Draa, on 16 December may have been a Tawny Eagle A. rapax or, perhaps, a Spanish Imperial Eagle A. adalberti. A juvenile Spanish Imperial Eagle was photographed west of Tan Tan in December and again in February; recent satellite tracking indicate birds disperse as far south as Senegal. On 31 December, an adult Dark Chanting Goshawk Melierax metabates was reported at Oulad Teima, where the species has not been seen for many years. In February, Barbary Falcons Falco pelegrinoides were recorded at Agadir (an immature), Tamri (a pair) and near Oukaimeden (a pair). A Greater Sand Plover Charadrius leschenaultii video-taped at Dayet Srji, Merzouga, Tafilalt, on 13 March 2006, was recently identified and appears to be the first for Morocco. A Broad-billed Sandpiper Limicola falcinellus was photographed at Oued Souss on 23 March; The Birds of Morocco (Thévenot et al. 2003) mentions 11 previous records for the country, of which six at the Souss estuary. On 24 December, a first-winter Franklin’s Gull Larus pipixcan was reported from Oued Souss. A first-winter Grey-headed Gull L. cirrocephalus was at Oued Massa on 24 October. Ring-billed Gulls L. delawarensis were identified at Anza (first-winter on 16-21 January) and Oued Chbika (second-winter on 19 January). Two Common Gulls Larus canus were at Oued Souss on 16 January, with one there on 3 April. Good winter rains resulted in exceptional numbers of Pin-tailed Sandgrouse Pterocles alchata at Ikniouen Road in late March, with a flock of c.1,000 passing over on 29th; c.200 flew over Merzouga on 24th and 30th. A Marsh Owl Asio capensis was found dead at the mouth of the Moulouya River in the north-east on 11 February. The first Rose-coloured Starling Sturnus roseus for Morocco was a first-winter male at Essaouira on 23 February. Three Brambling Fringilla montifringilla were in the Oukaimeden area on 17 February. Records from March-August 2006 include the following. Three Madeiran Storm-petrels Oceanodroma castro were feeding in Dakhla Bay, Western Sahara, on 11 March. A single Houbara Bustard Chlamydotis undulata was seen at the species’ former stronghold at Tagdilt track, Boumalne-Dadès, on 26 March. In Tafifalt, 12 km north-east of Merzouga, a nest was found but all hatchlings were trapped and taken to a Saudi breeding programme in the first days of April. The second Buff-breasted Sandpiper Tryngites subruficollis for Morocco was photographed at Ouarzazate on 24 April; the first record was in 1996. Another was found with an Upland Sandpiper Bartramia longicauda between Sidi Moussa and Oualidia on 28 September. A second-year Baltic Gull Larus f. fuscus ringed at Pori, Finland, on 28 June 2005, was discovered at Anza, Agadir, on 23 February; this is one of the westernmost ringing recoveries of a gull ringed in Finland for Africa. If accepted, an adult Kelp Gull L. dominicanus vetula on the beach at Agadir on 28 August will be the first for Morocco. An adult Common Gull L. canus was at Merja Zerga on 28 May. At least three Plain Swifts Apus unicolor were identified at Larache on 7 May; this is further north than previous records. Three Dunn’s Larks Eremalauda dunni were seen between Dakhla and Awserd (Aoussard), Western Sahara, on 12 March; Black-crowned Sparrow Larks Eremopterix nigriceps were found to be common there, with at least 25 individuals counted. On 5 April, a Dupont’s Lark Chersophilus duponti was watched at Tizi-n-Taghatine, a western breeding site which was unknown until recently. The third Citrine Wagtail Motacilla citreola for Morocco was observed at Oued Massa on 17 April. On 12 October, a first-winter Iberian Chiffchaff Phylloscopus ibericus was photographed at Oukaimeden, High Atlas; several other individuals were also present at this ski resort. The westernmost Balearic Woodchat Shrike Lanius senator badius for the country was observed at Aoulouz on 5 April. In Western Sahara, six Desert Sparrows Passer simplex were seen between Dakhla and Awserd, including a pair with young. Records from January-March 2006 include the following. Six dark-bellied Brent Geese Branta bernicla were at Knifiss lagoon, in the south, on 10 March. A male American Wigeon Anas americana was reported from Oued Massa, south of Agadir, on 15-26 January, with another at Marrakech on 21 January. A Red-knobbed Coot Fulica cristata was photographed at Oued Massa, in the south, where it is a rarity. A Laughing Gull Larus atricilla was found at Arghoud, near Agadir, on 1 March. The fourth Franklin's Gull L. pipixcan for Morocco was a first-winter at Oued Souss, Agadir, on 17 February. A first-summer Franklin's Gull was photographed at the same site on 6 April. A second-winter and two third-winter Great Black-backed Gulls L. marinus were found at Knifiss lagoon on 20 January; one was at Cap Juby on 10 March. A flock of five Pale Crag Martins Hirundo (Ptyonoprogne) obsoleta of the race presaharica was encountered in a deep wadi west of Aouinet Torkoz, between Tata and Tantan, on 10 January; this species is not often reported with certainty in Morocco, because of confusion with Eurasian Crag Martin H. rupestris. The song of (Eastern) Olivaceous Warbler Hippolais pallida of the race reiseri was recorded at Rissani on 4 April; the occurrence of this race in Morocco is poorly documented. A Brambling Fringilla montifringilla was at Dayet Aaoua, Ifrane, on 13 February, and a Yellowhammer Emberiza citrinella in the Souss valley near Oulad Berhill on 17 March. The first Greater Yellowlegs Tringa melanoleuca for Morocco was at Oued Massa on 16 November. Morocco’s second and third Franklin’s Gulls Larus pipixcan were a first-winter at Oued Massa on 3 November and an adult at Oued Souss, Agadir, on 4 November. The third Yellow-browed Warbler Phylloscopus inornatus was observed north-east of Agadir on 5 November. Records from September 2004–April 2005 include the following. On 26 November, a Western Reef Heron Egretta gularis was seen at Dakhla. A Great White Egret Egretta alba was at Oued Souss, Agadir, on 14 April. At Lake Sidi Bou-Rhaba, a male Ring-necked Duck Aythya collaris was found on 4 March. If accepted, an adult Sooty Falcon Falco concolor at Barrage Mohammed V on 19 September will be the first for Morocco. In November, 140 Eurasian Griffon Vultures Gyps fulvus were observed at Itzer on 16th, and a Common Gull Larus canus and two Plain Swifts Apus unicolor at Oued Souss on 9th. Three Spotted Crakes Porzana porzana were foraging underneath Aoulouz bridge on 13 April. A first-summer Black-headed Wagtail Motacilla (flava) feldegg at Derkaoua, Merzouga, on 11-12 April, was about the fifth for the country. What was apparently the first Isabelline Shrike Lanius isabellinus for the country, a first-winter, was also found the same month. At the Oukaimeden ski lift station, 22 Crimson-winged Finches Rhodopechys sanguineus were counted in late March-early April; this is a high number for this uncommon species. On 16 August 2004, a massive movement of 38,000 Black Kites Milvus migrans took place across the Straits of Gibraltar from Spain to Morocco. A first-winter Isabelline Shrike Lanius isabellinus was reported from Oued Massa on 2 November; this would be the first for Morocco if accepted. A Hooded Crow Corvus corone cornix, seen at Oued Smir lagoon just south of Ceuta on the Mediterranean coast on 22 October, may constitute the second for Morocco, following a report pending for 2003. The following were recorded in January to April 2004. An immature Great Northern Diver Gavia immer, 2 km south of Cap Rhir on 11 January, was the fourth for Morocco; possibly the same bird was seen off Aghroud, Agadir, on 2 April constituting the first spring record. Two Great White Egrets Egretta alba and a Booted Eagle Hieraaetus pennatus (rare in winter) were at Ouarzazate Lake on 6 January. In the colony of Northern Bald Ibis Geronticus eremita at Tamri, up to 49 possible nests were counted in March, with a maximum of 197 individuals present in the area. The entire Moroccan population now stands at 368 individuals, all in the Agadir region. At Dayet Merzouga, 190 Ruddy Shelducks Tadorna ferruginea and 50 Marbled Ducks Marmaronetta angustirostris were counted on 14 April. A female Cape Shoveler Anas smithii, the second record for Morocco, was at Oued Massa from 25 February until at least 6 March; the previous record was of a pair at Oued Souss on 26 April 1978; pending further evidence these birds are regarded as escapes. An adult female Lesser Scaup Aythya affinis claimed from Lake Afenourir, 30 km from Azrou, Middle Atlas on 6 April would represent a new species for Morocco if accepted; it was in the company of an adult male Ring-necked Duck A. collaris. In the Anti-Atlas, a Red Phalarope Phalaropus fulicarius was reportedly present at a rainwater pool along Tagdilt track east of Boumalne de Dadès from 25 February until 4 March. At the Oued Massa beach, a Grey-headed Gull Larus cirrocephalus was noted in late February. About 500 Audouin's Gulls Larus audouinii were at Aghroud on 2 November and between Taghazoute and Tamri on 11 January. The fifth Iceland Gull L. glaucoides for Morocco was a third-winter at Aghroud on 11 January. At Massa, a European Turtle Dove Streptopelia turtur and 2­3 Wrynecks Jynx torquilla were seen on 12 January; there are few records of these species in winter. Also there that day was the first Rufous Scrub-Robin Cercotrichas galactotes in winter. The number of Desert Sparrows Passer simplex in the Merzouga area, Tafilalt, seems to be decreasing as only four individuals were regularly found in the area around Café Yasmina; in addition, a nesting pair was discovered in an old palm tree close to Merzouga village. Records from October to December 2003 include the following. At Dakhla, a dark morph Western Reef Heron Egretta gularis was seen on 7 December. Five Ferruginous Ducks Aythya nyroca were at Oued Massa on 10 December. At least four Tawny Eagles Aquila rapax were between Goulimine and Tan Tan on 26 October, with another on 31 October. A Golden Eagle A. chrysaetos was 3 km south of Goulimine on 9 December. Single Barbary Falcons Falco pelegrinoides were observed at Mirleft, Massa, Tata and Lemseied in late October (with another at Tamri on 3 January 2003). A Grey-headed Gull Larus cirrocephalus, 30 Royal Terns Sterna maxima and a Little Swift Apus affinis were seen at Dakhla on 7 December. Six Orphean Warblers Sylvia hortensis were at Dawra on 27 October, with a late one at Oued Massa on 10 December. Records from April 2003 include the following. An Egyptian Nightjar Caprimulgus aegyptius was at the Auberge Kasbah Dakaoua between Erfou and Merzouga on the 12th. Single Icterine Warblers Hippolais icterina were noted at Skoura on 9th, Jorf on 10th and Merzouga on 12th. Two pairs of Desert Warblers Sylvia nana were found nesting at Dayet Srji , Mergouza on 11th. Twenty Desert Sparrows Passer simplex were seen at the well-known café Yasmina, Mergouza on 11th and 12th. The breeding season of 2003 was quite successful for the Northern Bald Ibis Geronticus eremita population at Oued Massa, where some 85 pairs fledged 100 young. The following were reported in January to April 2003. A Great Bittern Botaurus stellaris was at Oued Massa on 3rd March and 10th April. At Oued Massa, 52 Glossy Ibis Plegadis falcinellus were counted on 4th February. A feeding flock of 115 Northern Bald Ibis Geronticus eremita was regularly seen in the Tamri area. Five Ferruginous Ducks Aythya nyroca were at Oued Massa on 3rd March with a female Ring-necked Duck A. collaris. Barbary Falcons Falco pelegrinoides were seen at Tazzarine on 5th April and Boumalne on 7th April. A female Little Crake Porzana parva was at Oued Ziz on 12th February. A Houbara Bustard Chlamydotis undulata was at Missour on 12th April. A flock of 10 Great Spotted Cuckoos Clamator glandarius was 51 km. east of Freija in the Souss Valley on 6th February. Four Iberian Chiffchaffs Phylloscopus ibericus were in the Marrakech area on 6th April. Records from the period October to December 2002 include the following. At Layoun, 35 Ruddy Shelducks Tadorna ferruginea were seen on 23rd October and 100 Marbled Ducks Marmaronetta angustirostris were at Oued Massa on 7th December. A Red Kite Milvus milvus was observed between Layoun and Boujdour on 28th October. Forty Great Bustards Otis tarda were noted at Asilah on 11th December. At least 2,000 Audouin’s Gulls Larus audouinii were at Dakhla in October and a flock of 250 was on a beach north of Agadir on 10th December. At Merja Zerga, 26 Marsh Owls Asio capensis were counted emerging from their well-known roost on 29 November. 20 Plain Swifts Apus unicolor were at Layoun on 23rd October, with another 3 at Awfist on 28th. A Bluethroat Luscinia svecica was at Dawra on 29th October. Records from the period March to April 2002 include the following. The adult Common Gull Larus canus at Oued Sous, Agadir was presumably the same individual present in previous years. There was also a Lesser Crested Tern Sterna bengalensis present on 14th April. Isabelline Wheatears Oenanthe isabellina were recorded at Bou-Bernous on 28th March, at Tazenakht on 2nd and 13th April, and at Erfoud on 11th April. Records from September 2001 to February 2002 include the following. An American Black Duck Anas rubripes was claimed at Oued Massa on 15th February. Five Ferruginous Ducks Aythya nyroca were at Sidi Bourhaba on 6th November. An immature Tawny Eagle Aquila rapax was seen 10 km north of Moulay Bousselham, in north-western Morocco, on 28 February; this is an unusual site for this species. At Oued Loukkos, Larache, 900 Red-knobbed Coots Fulica cristata were counted on 4th November and more than 1,000 on 28th February. An adult Common Gull Larus canus was recorded at Oued Sous on 4th February, an Iceland Gull L. glaucoides at Agadir harbour on 21st January and a Common Guillemot Uria aalge at Cap Rhir on 2nd February. A Chimney Swift Chaetura pelagica was briefly seen at Tassila, Oued Massa, on 21st September. Isabelline Wheatears Oenanthe isabellina were reported from the Sous Valley south-east of Igoudar on 21st February and near Erfoud on 24th February. During mid-September, Iberian Chiffchaffs Phylloscopus ibericus were seen at Ifrane and Michliffen (with three on 13th), Aguelmame Sidi Ali and Sidi Bettache. At least two adult Woodchat Shrikes Lanius senator of ssp.badius were identified at Aoulouz. gorge on 19th September. An Azure-winged Magpie Cyanopica cyana was claimed to have been briefly seen from an airplane that had landed at Tangiers on 8 January; this would apparently constitute the first for Morocco and Africa.